At last, Volume 6. I hope you’ve anticipated it as much as Zelda and Return of the King. 21. Our parents are REALLY funny. Like a proud mother, I could post regularly all the entertaining things they say, but I’ll just post my two favorites for the year. Thing learned, sometimes when you type out the funny things your parents say, it makes you sound like a bunch of rednecks. 22. Near Naples, Italy there is a tunnel called the Tunnel of Psillipo. It is really tall and narrow. It is like 80 feet tall and 20 feet wide. It is a half mile long. It was built by the Romans and has a tomb for some important guy. But the coolest thing of all is… This long narrow tunnel is totally illuminated by the sun only once each year… at sunset on Halloween. I’m not sure if this true, but it sounds so cool that I’m going to decide to BELIEVE it wholly and completely. Thing learned, if you’re going to see the Tunnel of Psillipo, go on October 31st. 23. Sometimes police men will pull you over because you have a dirty license plate. What do they say when they come up to your window? They say, “No big deal ma’am, but your license plate is dirty and it makes it hard to read.” What do I say in return, “Uhhhh, okay.” LOOONG AWKWARD PAUSE. Then they say, " So maybe just get that cleaned." Then they just walk away and get in their car. Thing learned, the conversation with a policeman upon getting pulled-over always ends awkwardly. Always. 24. 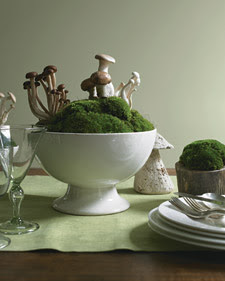 Martha Stewart has given me an idea of what to do with all the giant fungi that grow in our yard. If these things grow back this summer, I’m going to make it into one of these. Thing learned, Martha can make ANYTHING look sophisticated. Cali - You sooooo know that the police officer didn't expect to find a cutie like you driving the car with the dirty plate, right? The poor fellow was struck speechless!! I love reading your blog...and your comments. You get great comments. Cali, you are such a great writer - you make me laugh out loud. I loved reading about what you learned this last year. It was fabulous! I found your blog when your mom linked to it a few posts back! I have to ditto what everyone has said about your great writing skills and your sense of humor! Where are you moving to? Do you just not like it here in Richland? Best of Luck wherever you go! oh yeah, this is Tiffany (Byington) Fackrell! Even though my sis in law Tiffany has a different last name, people still get confused! So I just thought I would clarify...just in case!! my dad constantly harasses me for driving a Toyota also. I like my Toyota though, and I am pleased you drive one as well. Laurie got your b-day card, and she (we) thought it was awesome. Homemade, yet so high-tech! She's pretty busy w/ school right now. Anyway, I enjoy your writing and think you really should come up here and see us soon. No, Cali, your parents aren't nearly as funny as your comments about them.... your blog is a delightful pause in my day....it's become my "happy place". 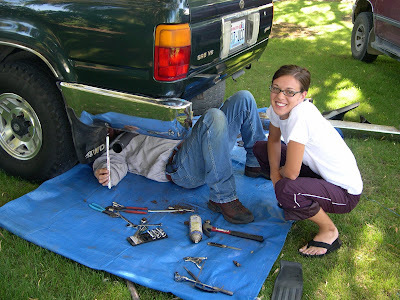 Oh Cali...I laughed out loud when I read about your adventures with your dad and fixing your bumper. 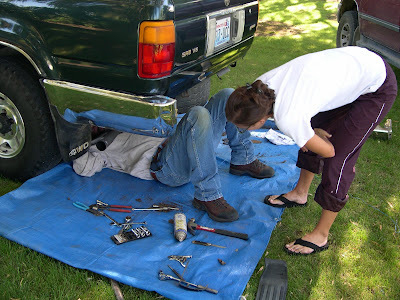 Many a time I have helped my dad-aka the wannabe amateur mechanic-fix something on my car-which 3 out of 5 times were my fault. Instead of being an escapee from Alcatraz, my dad morphed into a monkey and angrily jumped on the misbehaving car part. comedic gold every time.